The philosophy for teaching English at Brentwood Park Primary School is explicit teaching and student engagement. Various English programs and assessments are also tailored to suit students’ abilities and stages of development. The teaching of English is also incorporated in the teaching of all other subjects, including mathematics, art, computing and science. In all areas of English there is a whole school approach which leads to continuity throughout the school and deeper learning. Reading: CAFÉ, (Comprehension, Accuracy, Fluency and Expanding Vocabulary) and the Daily 5 initiatives are the basis of our whole school reading structure. 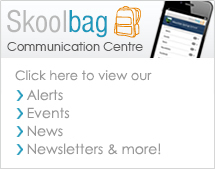 The sessions will explicitly teach strategies, such as identifying the main idea, inference, reorganisation, interpreting, summarizing, visualizing, evaluating, deciphering figurative language, making connections and analysing. This is done through the use quality literature, film, multimedia, poetry and songs. 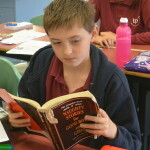 Continuing assessment takes place and differentiated activities are developed from the assessment. 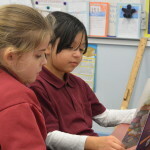 The whole school also undertakes the Premiers Reading Challenge. 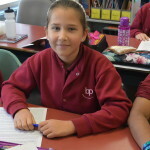 Writing: VCOP, (Vocabulary, Connectives, Openers and Punctuation) along with the Big Write is undertaken across all classes. The aims of this program is to embed learning by providing an encouraging environment, motivating and engaging students to write in a variety of situations. This is administered through quick sharp exercises and games, uplevelling work and child and teacher goal setting. Fortnightly, there is a Big Write where the students write in a dimmed room with candles lit while relaxing music is playing. After they have written, there is peer and teacher feedback and writing goals set. All students are encouraged to write daily and to enter writing competitions when opportunities arise. To ensure consistency with assessment, year level teachers moderate students’ written tasks with the same criteria. Spelling: A whole school approach is used with the teaching of spelling. The three strategies of Sound, Visual and Meaning are taught explicitly. Using various resources such as dictionaries and words charts, students investigate to compile their own lists of words with the same sound or same visual components. The Meaning strategy enables students to create ‘word families’ from the base word, while simultaneously learning to recognise nouns, adjectives, adverbs, compound words, word origins and verb tenses. 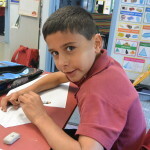 Speaking and Listening: Students are taught listening and speaking strategies. Articulation, communicating the speaker’s thoughts and voice projection are developed through opportunities to speak before an audience. Younger students participate in classroom discussion, feedback to the class and ‘Show and Tell’. Older students undertake debates, presentation of projects, and speeches at school assemblies. Year Six students present formal speeches at their Graduation Ceremony. Underpinning all areas of English is the Big Six which comprises off Oral Language, Phonological Awareness, Phonics, Vocabulary and Fluency. These are taught explicitly in all areas of English. Regular professional development sessions are provided by the English team to staff to ensure consistency in teaching English throughout the school.